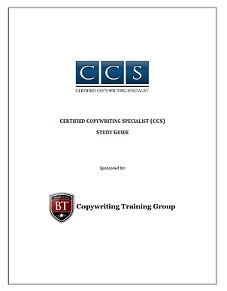 The Certified Copywriting Specialist (CCS) designation program is a self-paced training and certification program on copywriting fundamentals, industry terms, and best practices.The CCS program is self-study and 100% online. That means you get to set your own pace and take as long as you need. Participants learn to write in ways that are more effective and successful in selling; how to assess underlying, hidden beliefs of customers; and how to benefit from real-world case studies.
. 1.) Register for the CCS program.
. 2.) Purchase the required text book shared in the study guide and syllabus (below), and on the required reading page.
. 3.) Go through the materials in the books, videos, and audio resources. With the study guide and mock exam, study for . . the examination.
. 4.) Complete the project, as laid out in the study guide and on the project overview page.
. 5.) Schedule an examination and send in your completed project.
. 6.) Score an 80% or higher grade on the examination and project, and earn the CCS designation and certification. Most people can complete the program in 3-6 months, but there is no deadline or expiration to your registration. Once you register, you have lifetime access to the online materials and can complete the course at your own speed. 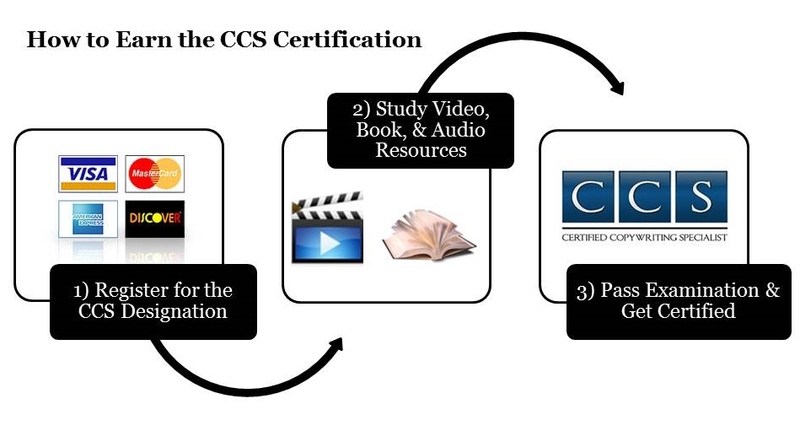 With an exam held every month, the CCS can be completed as quickly as you’d like. Interview with Jason Clegg: Jason is an SEO Article Marketing Expert. Listen to the audio with the player below to glean some tips, or use the link above to download the MP3. Copywriting Tricks and Techniques: Here is an example video from the CCS training program. After registering for this program you will get login details and access to our platform containing additional video modules, a practice/mock examination, and access to our team here for support and advice. You can watch the sample video here on Copywriting Tricks and Techniques, or use the link above to download the MP4. If you have questions about the program please call our team at (503) 922-2752 or see our list of common questions. If you are ready to get started please complete the registration form.